On the rare occasion that I’m walking the dog or driving the car alone, I enjoy listening to podcasts. Here are my 3 favorites about the importance of nature in kids’, and all of our, lives! Kenny blogs at A Sense of Wonder and is the founder of The Nature Kids Institute. I started listening with Episode 1 and was hooked. Saving what we love, creating a passion for nature, solve problems forming deep connections with natue, getting outside to learn — all these things are discussed by Kenny and his guests. So far only 5 episodes have been produced; I’m looking forward to many more! Michael is the founder of My Kids Adventures website, which encourages families to have fun together – many of suggested activities are outside in nature! 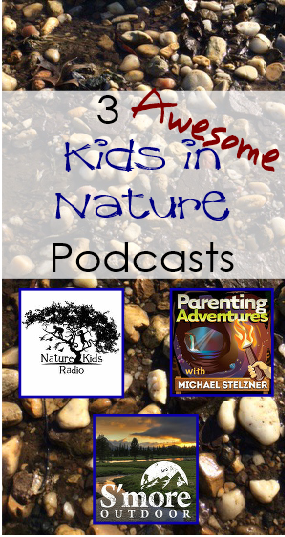 The podcast episodes that focus on nature include sticks, dirt, wildlife, and exploring the outdoors. I wish this podcast was still on going, but at least there are 12 to enjoy! I love this name, so clever! Brett’s podcast isn’t focused on kids but rather interviewing business folks who have been positively influenced by their time in nature. Sometimes seeing the long term effects of nature makes me more inclined to take my kids outside, even when I don’t feel like it. Brett’s S’more Outdoor website includes nice links to state & national parks in the USA. I originally started out listening to Brett’s Get S’more Outdoor podcast where he rambled about the “nature effect” and “recovering childlike wonder” – Brett appreciates nature and wants to share it! Do you have any recommendations for podcasts that encourage getting out in nature? Please share!